This is my concept for a Torbjorn rework. I wanted to make Torbjorn more active and less passive. My idea was to make Torbjorn a hybrid damage tank character. When he activates his ability he has to build them and can choose between building his damage ability, or his tank ability. For his damage, ability he builds robotic stilts that give him better height for combat, faster mobility and some jumping ability on cool-down. Other than that he mostly stays the same. For his tanking ability, he builds a molten core cannon with metal guard shield. The extra weight of carrying all that slows him down, but he gets extra armor and the shield also protects him. If the shield takes too much damage, it all breaks. The shield is solid, so you can’t pass through it, like Mei’s ice wall only mobile. His canon is powered by his molten core robotic arm and his hammer. When he fires, it’s very similar to Roadhog’s secondary fire. There is no reload or amo, but it takes time to prepare each shot. For Torbs Ult, he builds a massive turret that also shoots rockets. The turret is auto aiming and lasts for a short time. The turret can also be destroyed. Torb can keep the turret up for longer by maintaining it. The more damage it recieves or the longer it’s up the more maintenance it needs. In order to maintain it, you have to press the corresponding buttons to match the screen to keep repairing the turret. The mechanics of it would be similar to a hybrid between Hard Rain and Rockband. Anyways, that’s my concept, I hope you like it. Torbjörn constructs a pair of robotic stilts to improve his speed and provide him with a boosted vertical jump. 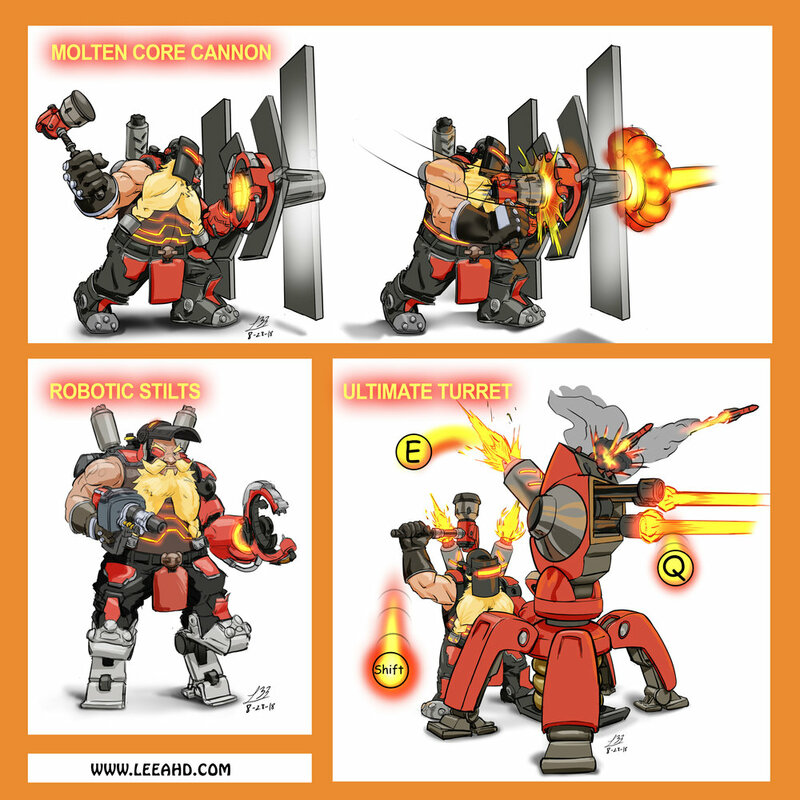 Torbjörn constructs a massive, enemy-tracking, autocannon and rocket launcher turret. Torbjörn can keep the turret up longer and even through damage by actively maintaining and repairing it as it takes damage and degrades.